Welcome to the lost world of Atlantis. Dark fate looms on the horizon as the four tribes are at war to save themselves. Harness the wisdom and mysterious powers of the Ancient Ones to build an expansive empire and conquer your enemies. It will take the utmost courage and intellect to prevail. Join the battle in Dragons of Atlantis and unleash the dragons today! 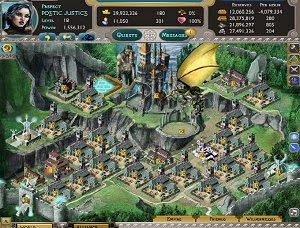 Build a powerful empire in an ancient and mystical land, raise a great and powerful dragon to defend your city, conquer adversity with an army of dragons, minotaurs, giants, and more. Harness the wisdom of a lost civilization to boost your abilities and participate in a vibrant community of dedicated alliances, fierce conflicts, and epic battles.